Looking for Things to do in Gracias? There are many different things to in Gracias. 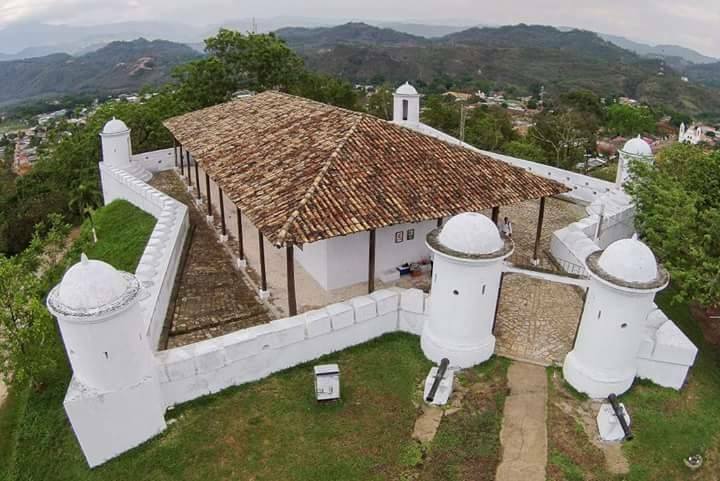 This is a great destination for both, cultural tourism, where you can visit historic buildings and experience the Lenca Culture. It is also a great nature destination, with the magnificent Celaque National Park and a variety of natural hot springs in the area. Finally, if you need to feel an adrenaline rush, you can try one of the different zip line canopy tours available in the area. Following is our suggestions of things to do in Gracias. We hope you have lots of fun there! Gracias is a small colonial city. Most of the interesting sites and buildings are within walking distance from the Central Park. I recommend starting your visit of Gracias with a brisk walking tour of the city. I suggest you start at Central Park. There you will find a statue of Lempira, the first Honduran hero. 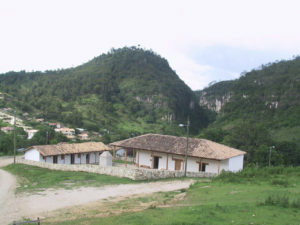 Lempira lived in the area that today is the department of Lempira. His stronghold was in the rugged mountains in a hill called “Congolon”. This hill is between Gracias and Erandique. From the North East Corner of the Park, where the local police station is, walk one block to the North. You will find the magnificent Iglesia de la Merced. 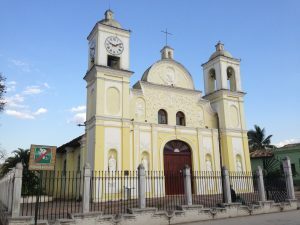 This ancient Catholic Temple is the oldest structure in town. The façade is relatively simple and plain, but it does have an elegant hand carved altar inside. The building dates from the early XVII th century. After a visit to the church, let’s return to Central Park. 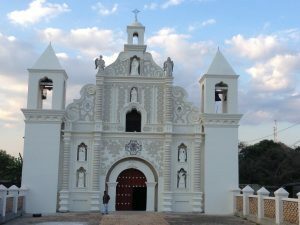 There you will see the Church of San Marcos. 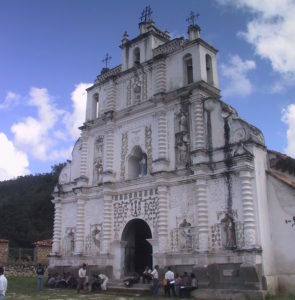 This temple is not as old as La Merced, it dates to the XVIIIth Century, but is the most important church in the city. Continuing with our walking tour of Gracias, we will walk up the street towards the south. There, next to to the Church of San Marcos you will find a façade with two lions. This is all that remains of the building that once housed the Audiencia de los Confines. Continue up this street and on the first corner take a right, and then a left at the next corner. You will soon come to a unique store: Envasados y Dulces Lorendiana. Feel free to walk in, but beware, you will want to buy something here! The shelves are full with jars that include anything from hot chili mixes to fresh jellies and jams. After you have finished with your shopping, take a right as you exit the store. 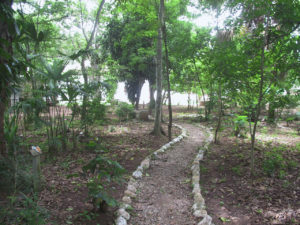 Trails within Casa Galeano’s Botanical Garden. We will now head towards the San Sebastian Park and Church. To get there take the first right, then the first left. Continue walking for two blocks to arrive at the park. The Church is not of any interest, as it was rebuilt in the XXth century. on the corner of the next block you will find the Casa Galeano. This is an interesting old home that is now a small museum. To the back of the building is a large garden that was once the most complete botanical garden in Honduras! Take your time to enjoy the museum and the garden. This part of the city has many trees and offers a pleasant shade. Our next stop is the fortress of San Cristobal. To get there turn left as you exit Casa Galeano and walk two blocks. You will soon come to a fenced hill with a road leading up the hill. The fortress is not impressive, but it does offer the best view of Gracias from its location! This last walk will be uphill, but you will not be walking on the cobblestone streets! The fortress has well kept. Notice that it has a couple of lovely old bronze cannons at its entrance with the coat of arms of King Charles IV of Spain. After enjoying the view, you will be looking for a spot to quench your thirst. As you walk down the hill you will find a trail and a small gate that offers a short cut back into town. Best of all, it goes right next to the Restaurant and Bar at the Hotel Guancascos. There is no better spot in town to sit down and enjoy an ice cold beer. If you prefer a non alcoholic beverage, perhaps a fresh natural fruit juice or a glass of water will do! The view is spectacular! You might even want to relax and order lunch here, which, by the way is a good idea, because food here is great! This is the end of our walking tour anyway, so bon apetit! Gracias has a great reputation nationwide when it comes to hot springs. The most famous ones are those in the community of Arcilaca. 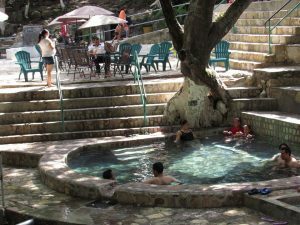 The Arcilaca hot springs are on municipal land, and the municipality is in charge of them. A local entrepreneur has leased them and is in charge of the daily operation. 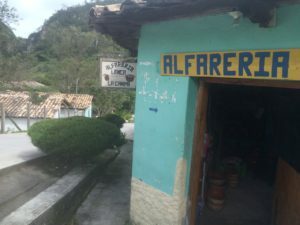 Arcilaca is about 6 km out of town, on the road towards La Esperanza. There is a well marked detour leading to the facilities. You will need to pay an entrance fee once there. The fee is to keep the facilities well maintained. It includes access to bathrooms, changing rooms and clean pools. The hot water springs within two different pools. Temperatures vary between 92 and 96 degrees Fahrenheit. You choose the pool with the temperature you prefer! 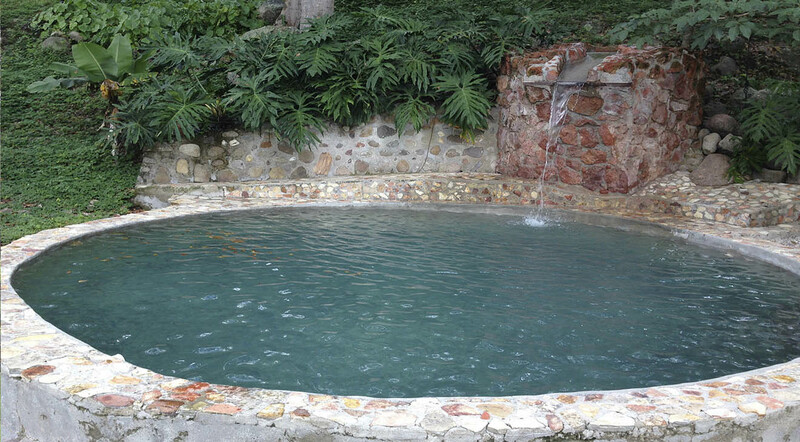 The spring water overflows to lower pools, so the water is always running and clean! A restaurant on premises offers basic foods, as well as soft drinks and beer. There are also towels, hammocks and inner tubes for rent. The downside to these facilities is that they can get crowded. If possible, avoid them on weekends and holidays. Chances are that if you are there during the week you will have the facility almost to yourself! Take note that there are two different facilities for these hot springs. The ones that I recommend are those at the source of the hot springs. The other facility is downriver and therefore the water is quite a bit cooler and not as clean. 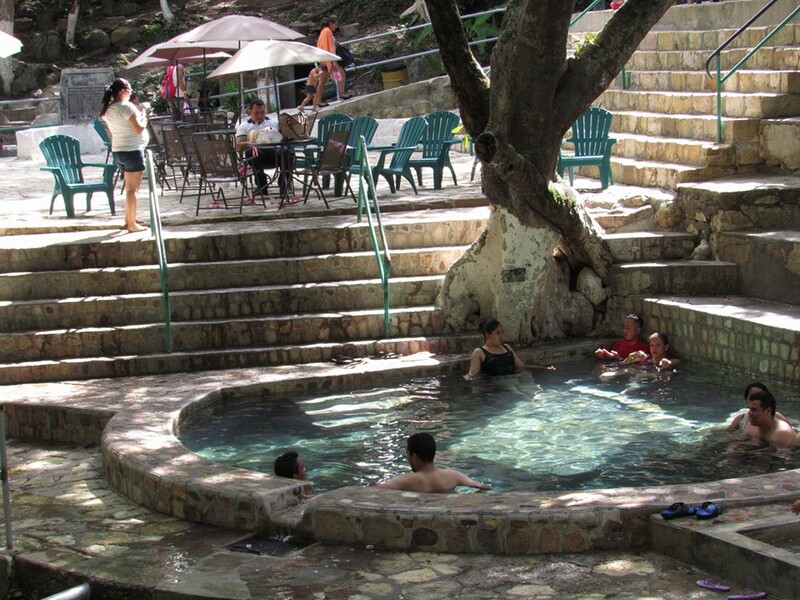 A second hot springs facility is 7 km outside of Gracias on the road towards Santa Rosa de Copan. This facility, Termas del Rio, belongs to the same family that owns and manages the Hotel La Posada de Don Juan. Here you will find pleasant pools with running water with diverse temperatures. The site offers clean changing facilities, good security and a pleasant family atmosphere. Entrance fee to Termas del Rio is Lps. 100 for adults and Lps. 50 for children. The facilities are open from 7:00 a.m till 9:00 p.m. Please note that the access gate closes around 7:00 p.m. So if you wish to visit at night you should be there early or call in to make a reservation. The setting here is much more private than at Arcilaca, but not as authentic. Another plus for Termas del Rio is that they offer a zip line canopy tour within their premises. They also have great camping facilities. A huge green mountain dominates the valley where Gracias sits. This massive mountain is the highest peak in Honduras and is home to Celaque National Park. 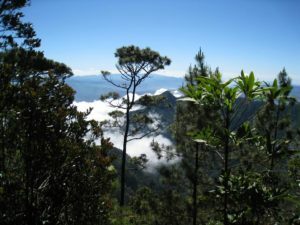 The Celaque National Park is 7.5 km West of Gracias. This park is home to the Cerro de las Minas, which sits at an altitude of 2489 meters above sea level. (This is equal to 9347 feet above sea level). This is the highest point in Honduras! Celaque means water box, and this is exactly what this mountain is. This forested mountain provides all the surrounding communities with fresh mountain water! Although there are other accesses to Celaque, the easiest is from Gracias. A road leads from Gracias to the visitors center. If you do not have a car, you can hire a tuktuk, or moto-taxi to take you there. En route you will pass through coffee plantations. At the visitors center you can get information about the different trails in the park. You can also hire a local guide to take you through the trails. If you are looking to climb to the top of Celaque, plan on two days to get there, another one to come back down. For a full day of treking, follow the Sendero del Gallo, or rooster trail. This trail gets its name from an epyphite that resembles a rooster tail that grows on the pine and oak trees here. The lower part of the park offers a nice pine, oak and liquidambar vegetation as dominant. Above the 1800 meter altitude (5,900 feet) level it turns into a cloud forest habitat. If you want a multi day trekking adventure, inquire at Hotel Guancascos in Gracias. Another good option is through or with Lenca Land Trails in Santa Rosa de Copan. They offer some great expeditions across the park. Do not try doing this alone, as you can get lost! La Campa is a nice colonial town only 16 km. away from Gracias. There is a good all weather dirt road to get there. It is set in a rugged, mountainous area, and is a picturesque little town. Its church, which dates from colonial times, has some pretty artwork in its altar. Additionally, La Campa is famous for the ceramic products produced here. These are everyday use items, they are interesting. You can find ceramic clay skillets, pots and pans all manufactured here. Don’t expect more artistic handicrafts, as you will not find them! You can buy pottery in the cooperative store in front of the church and at Doña Licha´s in the center of La Campa. As you come into town, you will find a nice building, known as “La Escuelona”. This old school house that has is now a small museum. You will see different ceramic products from the area. The exhibits offer pictures of natives producing them. A nice souvenir shop offers a variety of products produced here that you can buy to take home. Entrance fee to “La Escuelona” is only Lps. 30.00 per person. If you want to meet some local artisans working on their products, stop by and meet Doña Desideria. Her home is on the exit of La Campa towards San Manuel. She is usually working on her veranda and gives pottery demonstrations for a small fee. Her son Leonel has become a fine artisan himself and has his own workshop facility. For a more complete understanding of rural life around Gracias visit Cruz Alta and Tontolo. These two villages are about 30 min drive (1 h walk) from La Campa. Here you will see the lush nature of coffee plantations surrounded by mountains. You can visit two small woman’s cooperatives and see them at work. Pala is the pottery cooperative in Cruz Alta. Tejpa the Organic Paper Cooperative en Tontolo. A couple of basic hotels have opened their doors in La Campa. This means that it possible to spend the night in this pleasant and tranquil town. The Bellavista Hotel has a total of 6 rooms, some with private bath that are clean. This is your best bet to overnight in town. The owner, Doña Carmen Alvarez is a sweet lady that can help you out during your stay here. For reservations call 2625 4770. Nearby is the Hotel Daniela which has small basic independent cabana style rooms. If you want a local guide to show you around, I recommend Allan (9867-1389) and Doña Mercedes (9747-0834). As for food, there are some basic comedores in La Campa. Doña Mercedes can arrange food for you as well (call her in advance, especially if you are a group). Her chicken soup (sopa de gallina) is outstanding! There are minivans and pickups coming and going between Gracias and La Campa. Another alternative is to negotiate with the moto taxis. 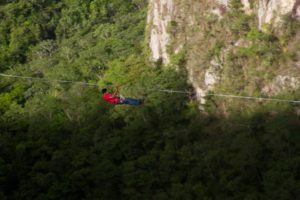 The most extreme canopy tour in Honduras is in La Campa. If you love the feel of adrenaline rushing through your body, this is a true must! This zip line takes you from the top of the canyon all the way to the bottom. 6 different zip lines will provide the perfect rush for you! To arrange this tour contact the operators through their facebook page. 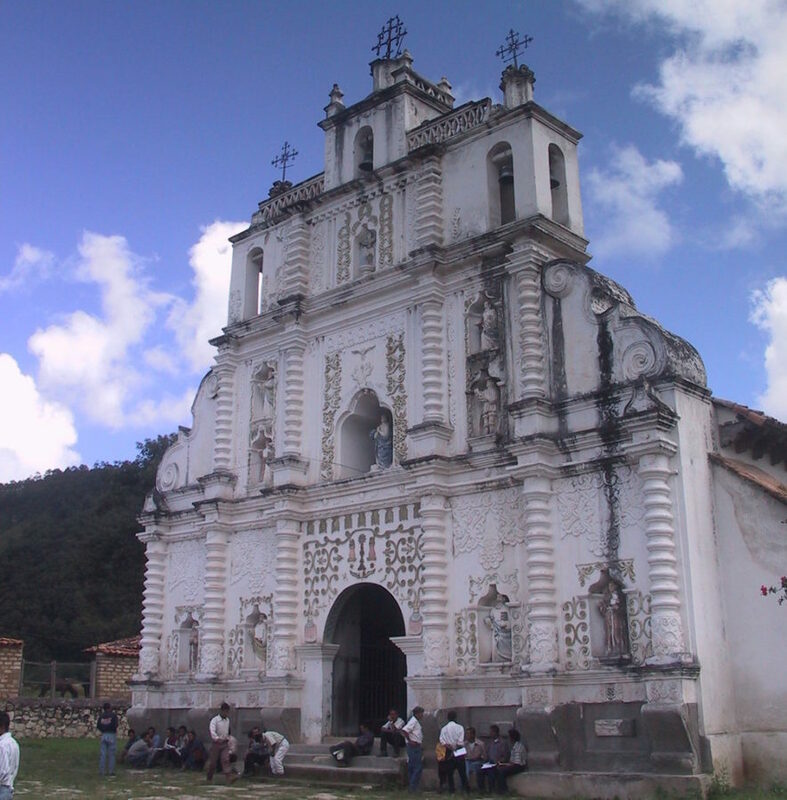 San Manuel Colohete is 16 km. beyond La Campa. The all weather dirt road leading to this remote town is now in good shape. There is bus service from Gracias once a day. This town has one of the most beautiful and best preserved colonial churches in Honduras. It is well worth visiting the town and meeting its friendly people. There are a few basic lodging options in San Manuel. For up to date information about these, contact Froni at the Hotel Guancascos in Gracias. There are several trails in the area that connect with between towns. An example is the trail to Belen Gualcho on the other side of Celaque Mountain. The hike to Belen Gualcho is a long one and will take two full days of hiking. Again, Frony at the Guancascos can help you find a local guide that can lead you through these trails. You will see an interesting facet of life in rural Honduras. There are two different zip line canopy tours available in Gracias. The most famous one is the Extreme Canopy at La Campa. This zip line takes you on a wild ride with six different cables. You will feel the adrenalin rush through your body as you zip almost one thousand feet above the ground. The ride will take you from a mountain top ridge to the bottom of the Canyon. 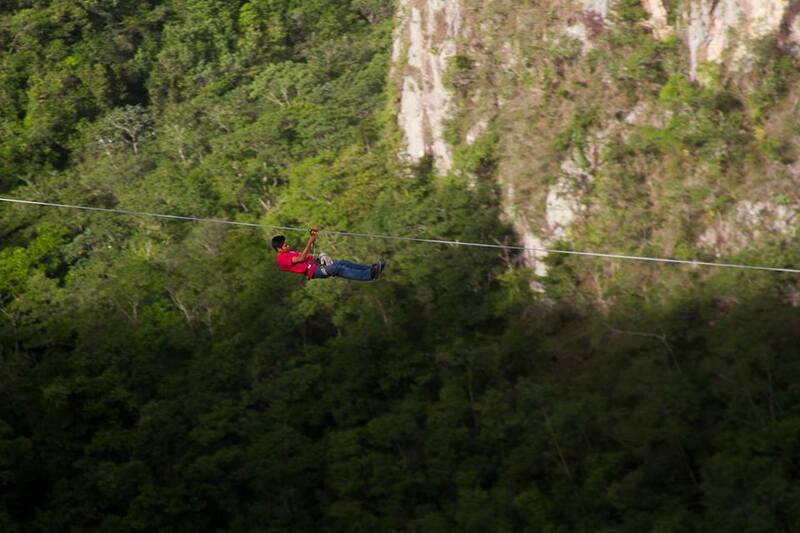 This zip line is the highest in Central America! A second, tamer alternative is at the Termas del Rio hot springs facility. This is on the road between Gracias and Santa Rosa de Copan. Don’t get me wrong, this is still a wild adventure! a Total of 6 cables, plus two cable bridges are not for the weak of heart! Spectacular views of the Mejocote River and Valley are there for you to enjoy! Best of all, after the excitement of the zip line, you can relax in the hot springs! The zip line is appropriate for all ages. You can book it through Termas del Rio or the Hotel La Posada de Don Juan in Gracias. Finally a third, less extreme option is available at Villas de Ada tourism complex. This alternative is closest to the city of Gracias. You will not experience the thrill of high altitudes here, but you will feel like you are flying over the ground! As you can see, you can find the perfect fit for you when experiencing the thrill of a zip line in Gracias!